How small….downsize and solo. – Dirty wet dog , boats and sailing. Note to regular readers, this is a complete re-write of a very early post of mine. In this case and because it’s a complete re-write i have given it a new working title and left the old post archived. This post is essentially the follow-on post to ‘How small…ocean’. In the first re-write post in this series i took as an introduction the idea of undertaking longer voyages with smaller boats. In the original post i focused on the boats and passages of Roger Taylor and his junk rig conversions of first a 21 foot Corribee and then a 24 foot Achilles. When i came to the re-write i first realised that very few sailors would be able to relate to his extreme voyages and also that although many sailors will have done long refits that his 2 year total rebuild project is something that few would contemplate. In this post i want to take as a starting point a single person that we met while on passage ourselves, in this case a solo lady sailor with her own very standard boat but out there and doing some miles. The main point of this post is to explore the idea of how small we can go and still have a viable cruising boat and without having to do a major rebuild or significant amount of modifications. As many of my regular readers will know i spend quite a bit of time thinking about starter boats and micro-cruisers and that a lot of that comes from those boats often being the ones that i have contemplated owning myself. This post also relates to that idea but features somebody else’s solution to the question of what boat to have at what budget and be manageable for a single person. As it is i think that with my boat, a Hunter Liberty i am just about at the smallest practical size for a boat for a large me when solo and that can accomodate my partner as well when we are 2 up. In the past, with more flexibility i could have reasonably had a smaller boat for solo sailing and for quite a while chased the similar Poacher cat ketch which i have covered on the micro-cruiser series. This post features a boat that although i have considered has always been outside my budget for a small boat : the Cornish Shrimper at 19 feet…..and in this case her lady owner who i spoke with. 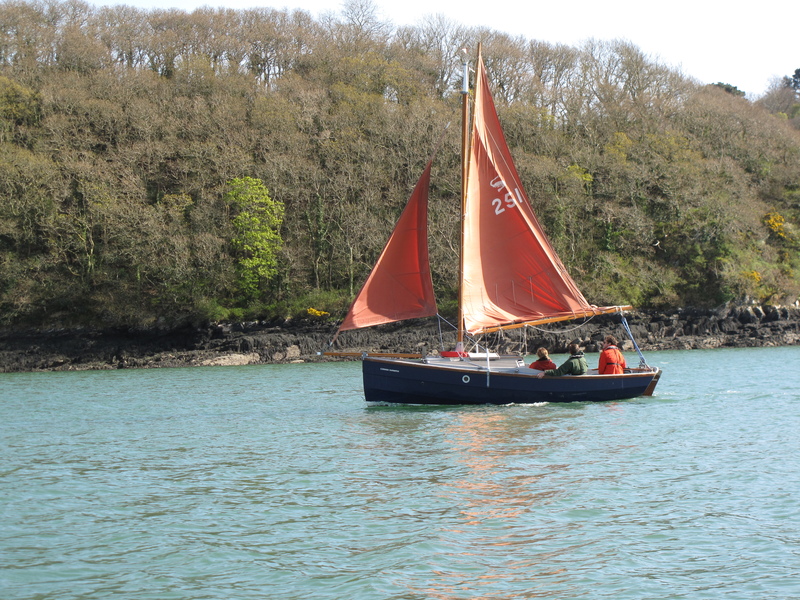 A potted history of the Cornish Shrimper is that they appeared in 1979 as a multi-chine plywood design by Roger Dongray. I don’t know how many plywood boats were built but the design transferred quickly to a GRP build and became rapidly popular. The initial, mark 1 design, didn’t have a self-draining cockpit and that design was first updated in 1996 to the mark 2 design which had several changes including the self-draining cockpit. Later models also swapped the outboard motor for a small inboard diesel and the interior layout was altered to include a vee berth. The initial rig was a gunter although i believe there is now a bermudian version. The boats are raced actively all around the coast….we have a very active fleet of these boats nearby down in Falmouth and i also see them just about everywhere i go as cruising boats. Seems a bit precarious ! The Shrimper on the blocks and the one in the lead photograph are, i think, the same boat and i spoke with the owner while i was based in Mylor last year. He said that the Shrimper was the perfect boat for him to sail solo with his 2 young daughters aboard and that they could have ‘micro-adventures’ in the local area without them getting frightened or bored. The day that i saw them sailing up past the King Harry ferry they all seemed to be happy on board. Now, that kind of sailing i have a lot of time and respect for : the owner gets a sail, the kids get a safe introduction to sailing and have somewhere to duck into when they want a break. I can’t help but think back to the couple on the ‘posh’ 40 footer from the previous post and wonder if they wouldn’t have been better off with a seat of the pants sailing experience to start with…..it’s certainly the way that most of us learn our basic seamanship. Shrimper alongside the little marina in Wells, Norfolk. Anyway enough pontificating and on to today’s salty tale. This one comes from the time when i had my Frances 26 (WABI”) and went off on my ‘retirement’ cruise 6 years ago after a long and expensive refit. I did the main part of that solo including an even longer channel crossing from Falmouth to L.Aber-Wrach although i had an excellent wind vane self-steering rig on that boat and she was an excellent solo seaboat. Anyway , at the end of that cruise i came back across the channel with Jax aboard and we had a difficult passage with extremely poor visibility for the last 30 miles home. I was very relieved to get back to a grey and claggy Falmouth after a choppy and zero viz night at sea. After a days rest in Channals creek we had to make passage again the next day and only went as far as Fowey which is where the story with the Shrimper and her lady owner really starts. Frances 26 (WABI”) at anchor in the Fleuve Odet. The context of this story is that after my ‘retirement’ cruise we would be completing on a cottage in deepest, darkest Cornwall and i was going to take on the major project of re-working all the outdoor spaces : essentially 2 large gardens. That meant selling the boat and downsizing my sailing and/or not having a boat for a while…..so i was actively looking at smaller boats that i might be able to keep either at home or nearby. The Cornish Shrimper is a boat that i had always liked so i was taking that opportunity to look at a nice one and talk to the owner. As is the Shrimper is physically a too small boat for me inside but it looked to be perfect for the petite lady owner of the one we were moored next to. The sailing story here is that both of our boats were heading in the same direction, us 2 up and her solo. We had both pulled into Fowey to pick up better weather information because it was still being a bit gnarly for a loppy-chop coming onto that coast from the south and still with patches of poor visibility. The owner of the Shrimper was a little bit anxious about doing the leg to Plymouth on her own and one outcome of our conversation was that i suggested we sail in company….no big deal but just a bit more reassuring to have another boat watching out for her and that’s ultimately what we did the next day. I had thought that the Shrimper might struggle to keep up with the longer and more powerful Frances in reaching conditions so i started out with the second reef pulled down rather than the first. What surprised me was how easily the smaller boat kept pace with us although i do think that being inshore of us she was experiencing less foul tide but that i had to drop a reef out to keep station with her. Her story is that she had done some dinghy sailing as a teenager and had then been married to a boat owner but that the marriage had ended and she then wanted her own small boat. Reading between the lines it did sound as though the sailing relationship hadn’t been a good one and that although they had cruised quite a lot that she hadn’t come out of it with much actual sailing experience herself. Watching her handle the Shrimper on the day suggested that she was not only competent but a ‘quick’ sailor and maybe just a bit under-confident on coastal passages. The point here though are that the boat suited her size and strength almost perfectly, she really enjoyed being her own skipper and that in downsizing from a larger boat she had got a higher quality boat with much better equipment and crucially that running a much smaller boat was do-able on a small income. Her view was that the 19 foot Shrimper was her perfect cruising boat and that she couldn’t see any benefit in owning anything larger. She was actually talking about modifying the interior slightly to give her just one very comfortable bunk one side of the board case , one really comfortable place to sit on the other and then a better arrangement for navigation and cooking. Now, the Shrimper is really a very good little sailing boat for it’s size, it’s easily trailerable and i know of Shrimpers that have been across the Channel. I would have had no concern about taking one across the same route as i later did with my Liberty. I don’t think the boat would work as well for me because i am much taller and larger but then it’s not my boat. I happen to think that the 22 foot Liberty fulfills the same role for me in a very slightly larger package that matches my size better than the Shrimper would but that the other benefits of downsizing also apply…..in that i can afford to run the boat and when i replace gear i can do that with high quality choices rather than marginal ones……top end anchors come to mind. There is another twist in the tale here and that involves another sailor and a different 19 foot boat and a very interesting voyage concept Festering away in the back of my mind was the idea of not just downsizing the boat but also downsizing the adventure while at the same time having more enjoyable sailing in shorter packages than long cross-channel solo passages. I was kicking around the idea of a rolling voyage just around the Uk but visiting all of the kind of places that maxi’s and deep fin keeled IOR race boats just can’t get into….and that’s a huge swathe of the British coastline that i hadn’t yet sailed. Do remember that the bulk of my sailing experience up until this point had been with deep draft racing boats and that i was only just getting into the potential of shallow draft boats. I thought at the time that the Shrimper would make an excellent boat for the kind of voyage i had in mind albeit a ‘high end’ and relatively expensive one for it’s size which is when i came across Dylan Winter’s voyage around the UK in a really really self-admittedly crap boat . Dylan’s story is that he had also learned to sail dinghy’s as a teenager an then later raced small IOR boats on the east coast : he mentions racing an ‘E’ boat one design several times. What he then did was to buy one of the worst small cruising boats around and start to sail it around the Uk putting into everywhere with just enough water to float and to film the whole experience. From watching many of his films again he must have done several seasons with the Slug until he bought a Hunter Minstrel, which is essentially the same boat as mine but with a different rig. Dylan affectionately refers to the boat as ‘the slug’….it’s a 19 foot mirror ‘offshore’ design by the way and as i say possibly one of the worst ‘sailing’ boats on the small boat market. I have never really worked out whether Dylan was just playing out a long running joke with the slug but he did demonstrate that you don’t even really need a ‘good’ boat and posh kit to actually get on the water an make some miles. I think now that maybe he could have found a much better boat for the money and he did eventually change up to a much better boat but that isn’t the point i think he was making. Watching Dylan and the slug was an almost satori-like experience of how small and basic can we go and still have a whole load of enjoyment out of the experience. Dylan’s answer is that it can be done in something as small and downright crap as the 19 foot mirror offshore but also that it might be a slightly more comfortable experience in a not much larger but better boat. There are of course even smaller genuine cruising boats and genuinely interesting people sailing them : the late Charles Stock and his boat Shoal Waters for example. That size of boat is a more specialist area though in that he built that one himself and there isn’t a stock* solution at that size….at least not that i know of. It was my moment of enlightenment via Dylan and KTL that set me off on the mental journey of considering small, cheap and often ‘lumpy’ boats as being perhaps genuinely viable boats for what i wanted to do next. Many readers will be aware that one outcome of that was my own choice of boat first and then a whole series of posts about budget/starter boats here and then into a consideration of micro-cruisers and even into dinghy-cruisers and so on. In reality my Frances 26 was a ridiculously over expensive project even though she was a very lovely boat to own and sail for the time i had her. At less than a fifth of the total cost of that boat my little Hunter Liberty i now rate as quite honestly a better boat for my needs and i have more affection for that boat than any other boat that i have owned or sailed. Well….this re-write turned into a much longer post than i intended and still leaves out the small boats at the end of my own mental journey…..that journey begins with ‘Shoal Waters’ and my own failed attempts to create a similar boat. Most of that has been played out in the blog somewhere already but it does leave a gap for a further exploration of dinghy sized boats especially now that i know of a local dinghy cruising sailor and blogger. *yeah i know….i’ll get me coat ! Previous How small and basic…cruiser. Enjoyed that as much the second-time around. A Hunter Medina/Hunter Horizon 21 is looking favourite for me in 2020 if I can get the money together next year, that is! Cheers Steve. Talking of sequels and the sea (sort of), you might be interested to hear that there’s a continuation of Das Boot coming later this month on Sky Atlantic. The hunter would be a nice boat. I was only looking at a similar boat just this morning at the yard. I missed out on the boat that i bid for on Ebay…a 27 foot bilge keel Jenneau Fantasia. Good new is that i have the first 2 parts of the camera rig and am just waiting on a secondhand peli case this week. After that it’s going to be mic and tripod. What i am chasing is a trailer for the Liberty…..she went walkabout after the heavy rain stick a tree on her mooring which chafed through the strops…..stressful week especially as the yard didn’t tell me. My kind of boat — cheers. Shame about your boat escape but all’s well that ends well I suppose. Good luck on the trailer hunt and great news about the camera gear. Keep on keeping on Steve. Thankyou and nice to hear from you.